The 200 miles of sand dunes fronting Lake Michigan's east shore is the largest collection of freshwater coastal dunes in the world and Sleeping Bear Dunes National Lakeshore, the only National Park unit in the Lower Peninsula, is the crowning jewel. There’s nothing like it anywhere else in the country. Established in 1970, the 72,000-acre park stretches between Frankfort and Leland and includes 35 miles of shoreline on the mainland, two remote islands in Lake Michigan and the largest dunes in Michigan. It is one Michigan’s best known destinations, an area that attracts almost 1.2 million visitors a year who come to play in the dunes; to hike, ski, camp, run wildly down the Dune Climb or simply sit on top of a dune and absorb the pastel blues of Lake Michigan. 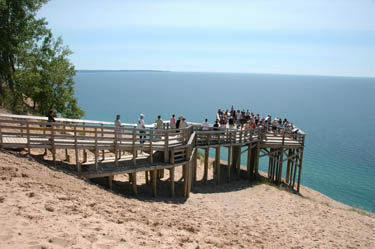 First surveyed for National Park status in 1958, Sleeping Bear Dunes was pieced together in the 1970s resulting in a bitter controversy. Individuals were forced to sell their property, almost 51,000 acres, to the federal government. In many cases farms and summer homes had been in a family for generations, the reason resentment towards the National Park Service still lingers in the area. But few people who visit the national lakeshore today would argue that its outstanding natural features or its cultural ones, including an 1871 lighthouse, are not worth saving from the development that has ravaged much of the Lake Michigan shoreline. Sleeping Bear Dunes is a long and narrow park, only six miles at its widest point with most of it lying in Leelanau County. The park was created primarily to preserve the fragile dunes along the shoreline but it is still wide enough to contain beech/maple forests as well as meadows of abandoned farm fields, wetlands, cedar swamps, streams and bogs. There are also 26 lakes in the park, which on most of them the use of motorized boats have been banned to preserve the water quality. 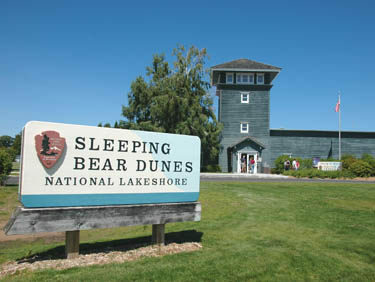 The most noted features of the park, however, are its dunes, high bluffs and dune plateaus. 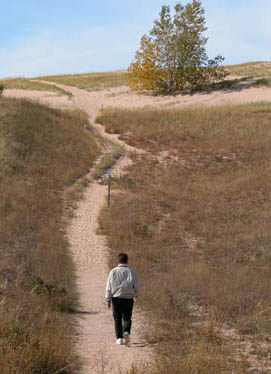 Towering Perched dunes are found on headlands bordering Lake Michigan such as Empire Bluffs, Sleeping Bear Bluffs, Pyramid Point and South Manitou Island. The Sleeping Bear Plateau is a 4 square-mile field of perched dunes, crowned by Sleeping Bear Dune, the highest perched dune in the state rising to more than 440 feet above Lake Michigan. Thanks to the high vistas and open country created by the dunes, the national lakeshore offers the best dayhiking south of the Mackinac Bridge through scenery that rivals anything you see north of the bridge. Mixed in with all those fine hikes are a handful of backpacking opportunities, including two island adventures and a beach walk along an undeveloped stretch of Lake Michigan. The park maintains a dozen trails that total 60 miles on the mainland and extensive trail systems on South and North Manitou islands. Due to the fragile nature of the dunes, mountain biking is prohibited for the park’s trail system. Backpackers can enjoy easy overnight outings on Platte Plains or Valley View Trails that feature walk-in campsites or an unusual, 36-mile beach hike from near Point Betsie to almost Glen Arbor. For the most remote and wilderness-like adventure, however, backpackers jump on a ferry in Leland and head to North Manitou Island, a wild place without cars or any development other than a ranger station and a campground. The first stop for visitors should be the Philip Hart Visitor Center, at the corner of M-22 and M-72 in Empire. It’s distinct 50-foot tower is modeled from the U.S. Life-Saving Stations that served the Great Lakes during the late 1800's. Inside the center is a large relief map along with exhibits devoted to the natural and human history of the area, a video theater, an information counter with trail maps and a bookstore. Sleeping Bear Dunes also has two campgrounds for car campers and RVers plus walk-in campgrounds at Platte Plains Trail and both Manitou islands. Backcountry camping is also allowed on North Manitou Island. Located 12 miles south of Empire along M-22 is Platte River Campground (231-325-5881). Completely renovated in 1992 at the tune of almost $4 million, Platte River is now one of the nicest campgrounds in the state. In an area forested in pines, Platte River has four paved loops of a 174 sites, 96 of them with electric hook-ups and 53 rustic. At the back of the campground are 25 walk-in sites where you camp in a much more secluded, wooded area 50 yards from where you park your car. Campground amenities include paved spurs, tables, fire rings, a sanitation station and modern restrooms with pay-to-use showers. 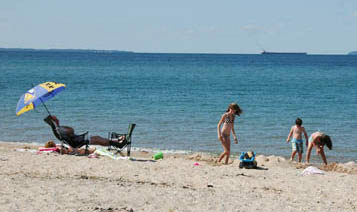 This campground is extremely popular in the summer but you can reserve a site in advance (800-365-2267; www.recreation.gov). Just east of Glen Arbor is D.H. Day Campground with 88 rustic sites. It lacks the hookups and modern restrooms of Platte River but a short walk away is one of the finest beaches in the park. DH Day is also very popular but sites are handed out first-come-first-serve. Get there early in the morning! Philip Hart Visitor Center is open from 8:30 a.m. to 4 p.m. daily with extended hours during the summer. All visitors are required to have a weekly vehicle entrance permit, an annual park pass or a per person pass if they arrive on foot, bicycle or motorcycle. You can purchase passes at the Philip Hart Visitor Center in Empire, at Platte River Campground and D.H. Day Campground or from self-service pay stations located at many trailheads. The Philip Hart Visitor Center is 22 miles from Traverse City via M-72 and located at the corner of M-22 and M-72 in Empire.